Wisconsin Homes Inc will be closed in observance of the Thanksgiving holiday from 3:00 PM November 23 through November 25. Normal business hours will resume on November 28. Our new website is mobile friendly, and easily responds to fit any size monitor, tablet or smartphone. Wisconsin Homes continues to simplify the ordering process with the addition of a new full color brochure. 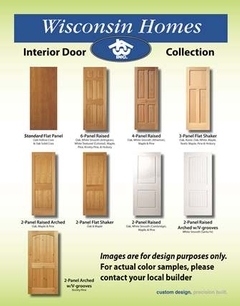 It will be easier than ever to select from our interior doors including French doors and barn doors. Choose from a number of wood species, stains and door styles. Please contact your builder for more information. Mortgage rates wandered upward for a third week in a row. Despite this, home loan rates are likely to remain low for the near future which is good news for the spring home-buying season. Wisconsin Homes is excited to offer a new Popular Options page to our website. 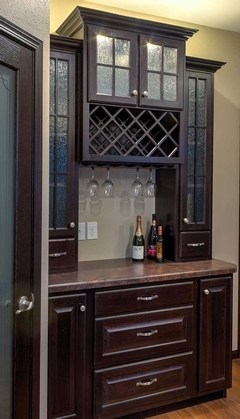 This page is loaded with awesome pictures of cabinetry, hardware, shelving, shutters, lighting and electrical options, etc. to add beauty and functionality to your new Wisconsin Home. As always, staying connected to our website is the best way to see our latest floor plan designs, renderings and gallery additions. Creditworthy borrowers with moderate to low incomes will be able to purchase a home with a down payment as low as 3% through Fannie Mae’s newly announced HomeReady™ mortgage program. Aimed at helping borrowers access an affordable, sustainable mortgage, HomeReady replaces Fannie Mae’s MyCommunityMortgage®, and can be used by both first-time and repeat home buyers. 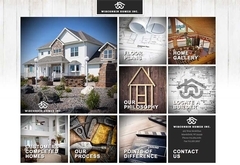 At Wisconsin Homes, we strive to deliver top of the line products for all aspects of your home. 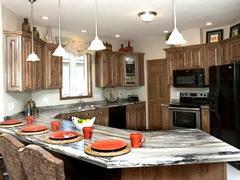 This month we will highlight our high quality counter tops.